Howard Young Life is starting! Here is a great opportunity for high school students to have fun and make new friends in a positive environment. Young Life is starting for students of Howard high school and any other high school students that want to be a part (I'm talking about you Long Reach, Calvert Hall, NDP, Chapelgate, Mt Saint Joe...). The kick off is this Sunday, March 3rd from 6:00 to 7:15 at the Livingston's, 5301 Talbots Landing in Ellicott City. Young Life is kind of like WyldLife but adapted to older students. There will be music, skits, games, and a talk from one of the college student leaders. You're going to really love it! What if I can't make it this Sunday? Young Life will be meeting the first and third Sunday of the month until the end of the school year (except for April 21st when you're at the beach for Spring Break). Were going to cap off the school year with a Bonfire, June 16th. Bring a friend! I hope to see you there! Make a difference! Feed the Hungry! Oct 13th! Saturday, October 13th, we will be harvesting broccoli, cabbage, and kale at First Fruits Farm. First Fruits Farm gives all its produce to the Maryland Food Bank. This is a great opportunity to help people in need of food here in Maryland and have a lot of fun with your friends at the same time! Please join us at 7:30 am in front of Elkridge Landing Middle School (farmers get up early). We should be back around 12:30 in the afternoon. To participate in this event, you will need to fill out the "harvest_concent_form" below, have it signed by a parent or guardian, and bring it to the event. Unfortunately, Patapsco Park is closed due to the flood last week. We have rescheduled the End of School Bash for Wednesday, June 20th at Watermont Swim Club from 6:00 - 8:30 pm. Watermont is located at 5819 Bellanca Drive Elkridge, MD 21075. When you get there, let the attendant know when you check in if you are a member. We'll have pizza, snacks, drinks and a warm welcome for new middle school students and a send off to our rising freshmen! Show your community that you really care and have a great time with friends at our combined Service Project/WyldLife Club @ the Volleyball House! We will meet in the cafeteria right after school ends at 11:50 to be transported to the Elkridge Food Pantry. We will make bag lunches for Howard County Grassroots and Blankets for Project Linus. Grassroots will distribute these lunches the very next day to homeless and hungry people in our community, and the blankets will be given to hospitalized children. We will then proceed to the Volleyball House (across the street) for an extended WyldLife Club including crazy games, music, pizza, snacks, and a talk by EES P.E. teacher Conrad Brookhart. Transportation will be provided from the school by parent volunteers, however, all students participating in this event will need to be picked up from the Volleyball House at 2:50 p.m. The Volleyball House is located at 5635 Furnace Ave in Elkridge. Please have a parent or guardian sign the attached form and drop it off at 6664 Hunter Rd, Elkridge, MD. Come join us for a night of space adventure! Each middle school students will need to have this player waver form fill by their parent or guardian before they can play. Check out this link to a photo montage of the incredible time we had at Rockbridge 2014! We had a great time harvesting cabbage and kale at the First Fruits Farm. 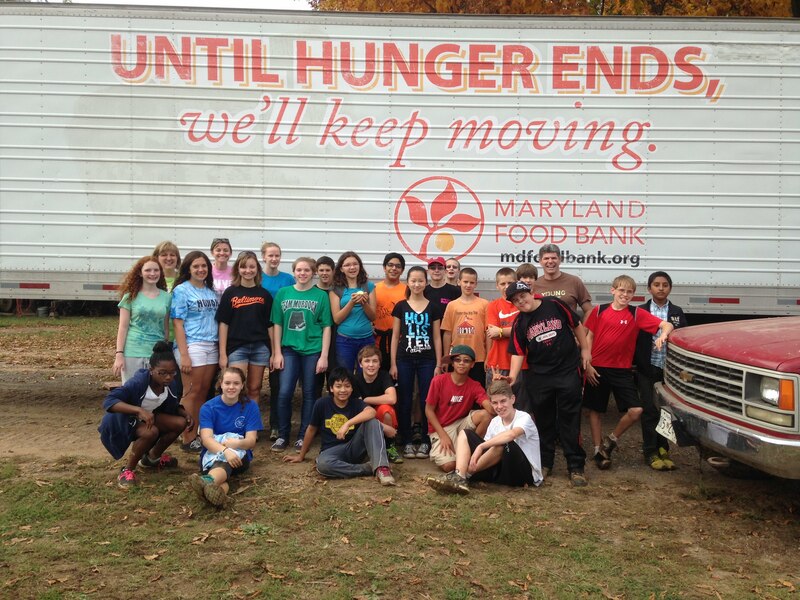 When we were finished we had over 4,000 lbs of cabbage and over 30 large bags of kale for the Maryland Food Bank. Great Job!